How Can A Snoring Mouthpiece Help You Stop Snoring? Snoring is an annoying and irritating sleep disorder that can make you feel embarrassed at times. The snoring mouth guard is a very popular solution to get rid of the snoring problem. 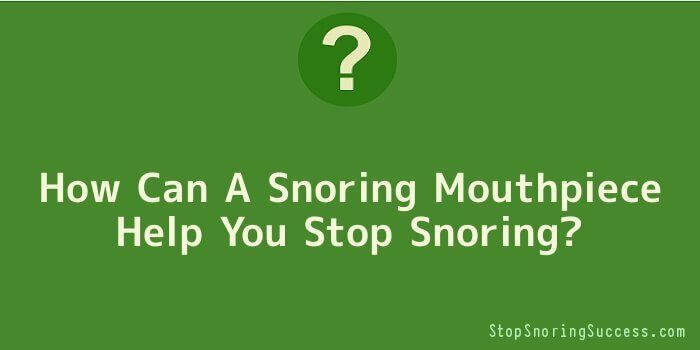 Many other self-help aids can also help you to get rid of the snoring problem. These include nasal sprays, nasal strips, and such. If you have tried out all of these and yet you snore, you may have to consult a physician to find out the exact cause of your snoring problem. Patients with OSA and the snoring problem are usually treated with a device known as the CPAP machine. This device is a respirator like mask that fits over the nose of the user while you sleep. This device blows air into your nostrils while you sleep. The problem with this device is that it is very cumbersome and many users do not like to use this device. If you are looking for a simpler way to get rid of the snoring problem, you may try a snoring mouthpiece to get control over it. There are mainly two different types of snoring mouth guard devices. The first type advances the lower jaw and pulls the tongue forward. This opens the airway and provides more space for the air to flow. As the air gets more space, the vibration of the palate and the throat muscles are avoided and hence snoring is effectively reduced. This type of device is called as the Mandibular Advancement Device. The second type of the device pulls your tongue forward and it is called as the tongue-stabilizing device (TSD). Usually, the TSD requires an adjustment period but it can be worn by everyone, even those without teeth, persons with jaw joint problems or gum diseases. SnoreDoc is one of the best snoring mouth guards available in the market today. This snoring mouth guard is made from soft rubber material that provides a very good comfort for the user. The greatest advantage of the device is that it can be molded to suit the shape of the user’s mouth. It can be molded two to three times and can be used daily for about 4 to 6 months or until it is worn out. The only disadvantage of the device is that it can be ordered only online.